It gives me great pleasure to welcome you here in London. On behalf of the Chinese embassy, please allow me to extend the warmest welcome and best wishes to you! In five days, the 14th Paralympic Games will be opened in London. As we all know, this will be the largest ever Paralympics. 4,200 athletes from 166 countries and regions will compete here. 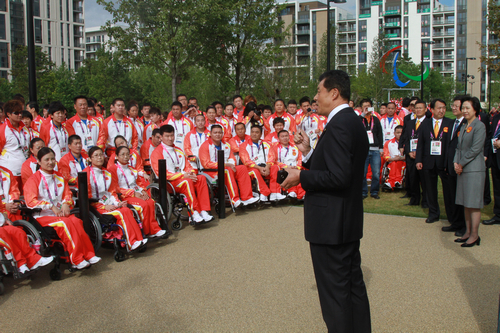 China has also sent a strong delegation with 414 members, including 282 athletes. 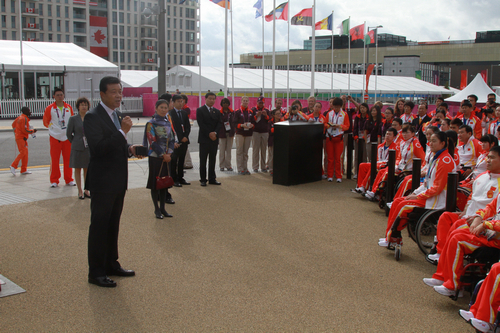 This is the largest Paralympic delegation China has ever sent abroad. During the London Summer Olympics just a few days ago, the Chinese athletes fought hard and achieved the best results at an overseas Olympics. I hope that you will continue the winning streak and earn greater credit for China. Yet what is even more important than competition is your bravery and pursuit of victory. Everyone of you has had a hard struggle and a moving story of self-renewal. Your presence in the competition in London proves that all of you have transcended yourselves and stepped onto the top podium in your life. During the Games I hope that you will unleash your maximal potential in the competitions, achieve great results and keep good spirit; I hope you can display the Chinese disabled people's combatant spirit of self-respect, self-confidence, self-renewal and self-reliance; I hope that you can demonstrate the progress and achievements in the undertakings for the disabled people in China; I hope you can present the excellent traditions of the Chinese nation and the image of China as a great country of civilization; I hope that you can increase exchanges and friendship with the disabled athletes from other countries and share the joy with them; and I also hope that you can make active contributions to the development of the sports for disabled people and to the progress in the undertaking for the disabled people around the world. Finally, I want to say that the Chinese Embassy is your home in London. We will do everything we can to support you, and we will cheer for you together with the Chinese community, students and those from the Chinese companies in Britain.